The stock market's become a big game of chutes and ladders, Jim Cramer told his Mad Money viewers Friday. Up one day, down the next, sometimes both directions in the same day. That's why investors need to continue to use extreme caution and only buy in increments on the way down. Earnings season kicks off next week and if this market has any hopes of a meaningful recovery, it will need strong earnings. But before earnings, Cramer said, he'll be keeping an eye out on Monday for additional Chinese retaliation on tariffs. Any action will be seen as a market negative. On Tuesday, Ethan Allen (EA - Get Report) will be holding an analyst day, and Cramer said he wants to hear if tariffs on imported furniture will actually help the company compete. Tuesday will also see the latest producer price index numbers, but Cramer said he doesn't expect any inflation in the PPI, or in the consumer price index on Wednesday. Speaking of Wednesday, Bed Bath & Beyond (BBBY - Get Report) will be reporting earnings and Cramer said he's worried about this retailer as it struggles to compete with Amazon (AMZN - Get Report) . Thursday sees earnings from Blackrock (BLK - Get Report) , and Cramer will be listening to hear how the mutual fund business is faring with all the volatility. Finally, on Friday, earnings officially kickoff with JPMorgan Chase (JPM - Get Report) , Wells Fargo (WFC - Get Report) , Citigroup (C - Get Report) and PNC Financial (PNC - Get Report) . Cramer said he expects to hear good things from the banks -- other than Wells Fargo -- as the economy continues to grow. How are hedge fund managers playing the escalating trade war with China? Cramer said they're likely using a strategy of "pair trades," and shorting stocks with Chinese exposure while simultaneously buying stocks with only domestic exposure. For example, hedge funds would short the stock of Yum China (YUMC - Get Report) , which could enter the tariff crossfire, while buying Yum Brands (YUM - Get Report) which only operates outside of China. If machinery is in the news, funds would short Caterpillar (CAT - Get Report) , which sells a lot of equipment into China, and pickup for United Rentals (URI - Get Report) , a 100% domestic operator. Another pair trade would be to short Starbucks (SBUX - Get Report) , which is seeing a lot growth in China, in favor of Dunkin Brands (DNKN - Get Report) . Cramer said he doesn't advocate these strategies for individual investors, as they're far too risky given how fluid the news cycle has been. But it's still important to know what the big money is thinking and where they'll be placing their bets. Cramer and the AAP team says the effect of Trump's tariffs on the market has been clear and confirms why they have made a major push in recent weeks to raise cash and reposition the Action Alerts PLUS portfolio toward domestically favored companies. Find out what they're telling their investment club members and get in on the conversation with a free trial subscription to Action Alerts PLUS. Don't let an ugly day like today scare you away from sectors that are working, Cramer reminded viewers. Case in point: the apparel sector, which has seen a stunning recovery over the past year, once again proving the Cramer mantra, "There's always a bull market somewhere." Shares of Nike (NKE - Get Report) were up 20% in the fourth quarter and another 10% so far this year thanks, not to shoes, but apparel. Meanwhile, PVH (PVH - Get Report) has soared 50% over the past 12 months on strong global sales of Calvin Klein and Tommy Hilfiger. Even the embattled Lululemon Athletica (LULU - Get Report) popped 15% after it reported strong earnings this month. The strength doesn't stop there. Cramer cited Michael Kors (KORS , up 75% over the past 12 months, along with Urban Outfitters (URBN - Get Report) and VF Corp (VFC as additional examples. Any of these names can be bought on any weakness, Cramer said, as they're all great values and great growth stories. 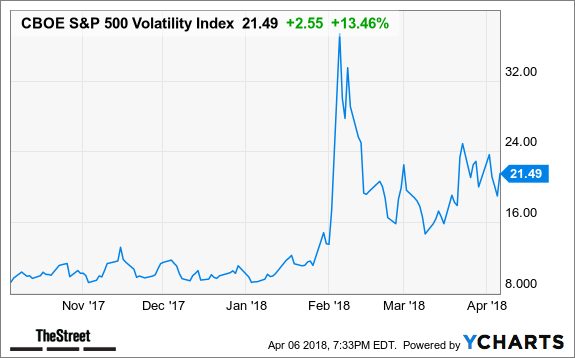 In a special "Off The Charts" segment, Cramer checked in with colleague Mark Sebastian to get the latest read on the CBOE Volatility Index (VIX to gauge the level of fear in the markets and where the major indices might be headed next. Looking at a daily chart of the S&P 500 and the VIX, Sebastian noted that back in January, the pair were rising in tandem, signaling a change of direction was close at hand. That change did indeed come in February, as the market tanked. But more recently, the S&P has been retesting those February lows, but the VIX is nowhere near its highs, signaling again that a change, this time to the upside, may be coming. He compared the recent pattern to that of 2015, when the Chinese stock market fell and our Congress was at a standoff over the federal debt ceiling. Cramer said he's not totally convinced that a rally is near, because this time the Chinese are partially in control of the narrative. But, he said, Sebastian's work remains solid. Over on Real Money, Cramer asks, "Is this the end of commerce with China? With Trump, who knows?" Get more of his insights with a free trial subscription to Real Money. In the Lightning Round, Cramer was bullish on SkyWest (SKYW - Get Report) , Southwest Airlines (LUV - Get Report) , Blackberry (BB - Get Report) , PetMed Express (PETS - Get Report) , Idexx Laboratories (IDXX - Get Report) , Novartis AG (NVS - Get Report) and GlaxoSmithKline (GSK - Get Report) . Cramer was bearish on Apache (APA - Get Report) , Philip Morris International (PM - Get Report) and Iron Mountain (IRM - Get Report) . In his "Executive Decision" segment, Cramer sat down with Lee Bird, chairman, president and CEO of At Home Group Inc. (HOME - Get Report) , the home decor superstore that hit an all-time high on an otherwise miserable day in the market. Bird credited At Home's success to their low-cost supply chain that provides mostly private label furnishings at great prices. Near a third of At Home's customers are millennials, which now account for their fastest growing segment. When asked about the possible effects of tariffs on imported furniture, Bird said they've been monitoring the situation closely since the first mentions of border taxes and remain nimble to combat any changes that may arise. Finally, Bird explained that At Home also has a robust online strategy, as customers today largely research form home, then buy in store. They feature over 50,000 products on their website. At the time of publication, Cramer's Action Alerts PLUS had a position in AMZN, JPM, C.